...... MSN Messenger password recovery application retrieves lost or forgotten email account login passwords. Lost forgotten Passwords of MSN Messengers is fully compatible with all major version of MSN messenger including MSN 6.0, 7.0 and 8.0. * User does not require any technical knowledge to operate this MSN explorer password recovery software utility. * MSN Messenger Password restoration tool reset email login password of MSN explorer. 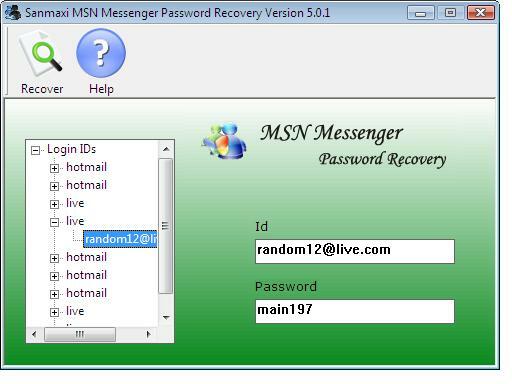 * MSN Messenger Password recovery utility supports multilingual password recovery. * Hotmail and MSN Messenger Password Cracker Tool is compatible to work with any windows operating system. * Hotmail and MSN Messenger Password Cracker Tool retrieves password of your email account configured on msn. Qweas is providing links to MSN Messenger Password Cracker Tool 5.0.1 as a courtesy, and makes no representations regarding MSN Messenger Password Cracker Tool or any other applications or any information related thereto. Any questions, complaints or claims regarding this application MSN Messenger Password Cracker Tool 5.0.1 must be directed to the appropriate software vendor. You may click the publisher link of MSN Messenger Password Cracker Tool on the top of this page to get more details about the vendor.